Download the "Litigation Facts" handout that was distributed at the Parish Meeting by clicking here. The Bishop, the priests of the Diocese, and one of the diocesan attorneys met Thursday June 14 to pray, ask and answer questions, and give counsel regarding our ongoing legal situation in the midst of our Christian mission to make disciples. The information from this meeting, and other reflection, has greatly helped me clarify where we are and where we're going - and I know that that same clarity is important for the whole congregation, especially in light of the widespread lack of correct or complete information being shared on social media. So with the Senior Warden's full concurrence, I am calling a special Parish Meeting/ Forum for this coming Thursday June 21 at 6:30 p.m. in the Parish Hall. Joining me will be Chip Sloan, the Parish's Chancellor (attorney), Jim Lewis, Assistant to the Bishop, as well as members of the Vestry and Contingency Committee. In addition to what we share, you will have an opportunity to ask questions. In addition, the Bishop has written the churches a letter to be shared this Sunday, June 17, and I will be reading it at each of our three services. I urge you to make every effort to attend both Sunday's worship services and next Thursday's Parish Meeting. Be at peace, stay the course, stay connected. As some of you are already aware, the United States Supreme Court announced today that it will not take our case for review. A succinct, articulate summary of our reaction and response can be found in the press release from the diocesan leadership printed below, and I encourage you to read it in its entirety. I would especially call your careful attention to the two paragraphs which begin "The Diocese of South Carolina will now return to our state courts..." and "The Diocese remains confident that the law..." These are significant statements for us, indicating that the Diocese's legal and ecclesiastical leadership has confidence that there is still much yet to be said and to be decided before any change in the control of the property occurs. Therefore, my best counsel is that we remain at peace, and that we continue to stay the course of our Parish's life as Christ Church in this place, in every way: in worship, prayer, fellowship, ministry, pastoral care and giving. I believe that this is a trustworthy position, and as I have promised you before, so I do again now: if/when that message needs to change, I will not hesitate to communicate that to you. The clergy will meet with the Bishop at St. Paul's, Summerville, this Thursday afternoon, June 14 to discuss all of these matters and our approach going forward. Please keep this meeting in your prayers. I am always glad to discuss any and all of these issues with you personally, and encourage you to contact me if you would like to do so. Charleston, S.C. (June 11, 2018) - Today the Diocese of South Carolina (Diocese) was informed that the United States Supreme Court denied its Petition for Writ of Certiorari. Doing so leaves in place a sharply divided ruling that could deprive at least 28 parish churches of their right to properties some have held for over 300 years. The Rev. Canon Jim Lewis observed, "We are disappointed the Court chose not to resolve a serious division in the lower courts, though our case was a providential opportunity to do so. The essential issue of what the Court means by "neutral principles of law" will remain unresolved for now." 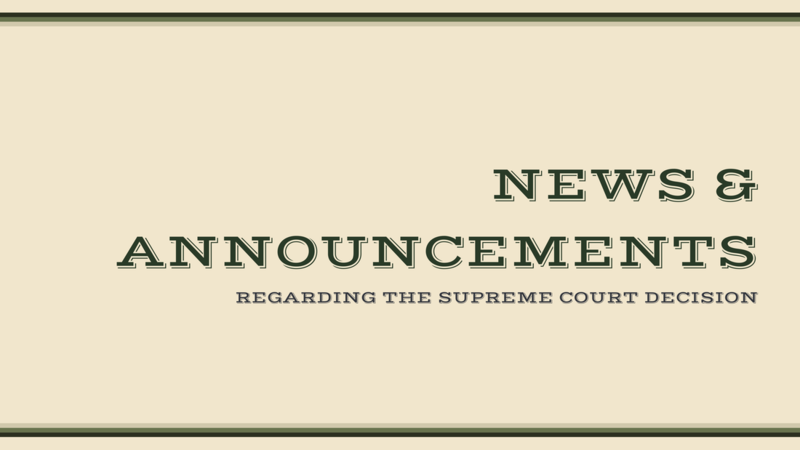 The Diocese of South Carolina will now return to our state courts, where the case has been remitted to the Dorchester Courthouse where it originated. An element of TEC's argument for the United States Supreme Court to deny our petition was the "fractured" nature of the South Carolina Supreme Court's ruling. Constitutional issues aside, the Diocese believes the conflicted nature of the current State Supreme Court ruling is virtually unenforceable as written. Interpretation and implementation of that ruling, given its five separate opinions, with no unified legal theory even among the plurality of the court, means there are still significant questions to resolve. Statement by the Rt. Rev. Mark J. Lawrence, Diocesan Bishop: "While, obviously, we are disappointed that the Court did not review this case, our hope remains steadfast in our Heavenly Father. There are many unresolved legal questions which remain before the State Court as well as matters for prayerful discernment as we seek to carry out the mission to which we are called in Jesus Christ. We shall seek his guidance for both."